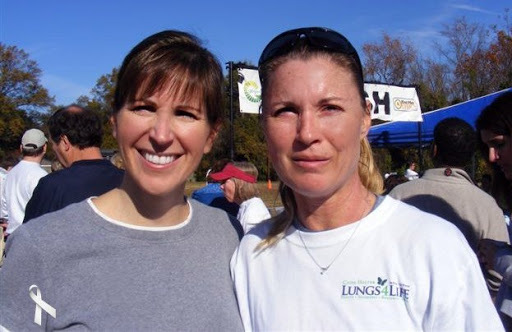 Did you know November is Lung Cancer awareness month? All over the country there will be fundraisers to raise much needed monies for Lung Cancer research. 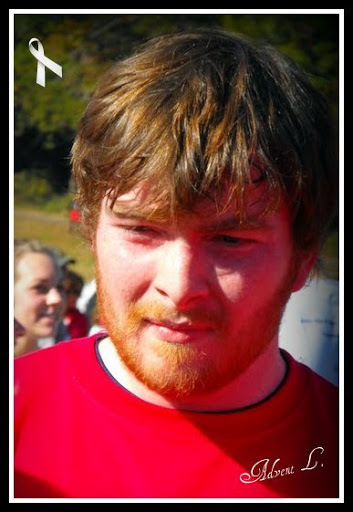 November 12, 2011, was the Caine Halter Lungs4life 5K run in Greenville, S.C.. It’s a great little run. 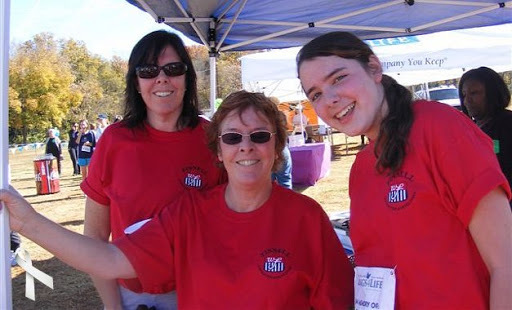 If you live in Greenville and went down to support Lungs4life, We would like to thank you. 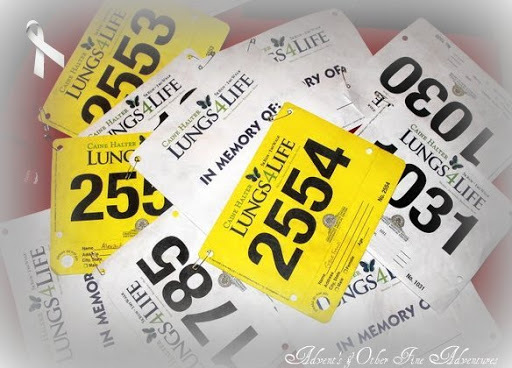 If you don’t live in the area and you find there is a Lung Cancer 5K or a one mile fun run that supports lung cancer research ~ please help by signing up for this race. You may think it does not matter, but surprisingly patients of Lung Cancer and those who have lost loved ones to Lung Cancer need you to be there to hold them up and to keep them strong. Most of all, Lung cancer research needs your money to find a cure. Surprisingly, Lung Cancer does not get the support it deserves. You don’t have to be a smoker to get lung cancer. Lung Cancer is out there and it is a killer. People that shouldn’t even have Lung Cancer die from Lung Cancer everyday . Did you know: Lung cancer remains the leading cancer killer in men and women in the Uniting States among every ethnic group, yet still receives the fewest research dollars. Lung cancer causes 1 in every 3 cancer deaths and took 156,940 lives in 2010. Let me repeat that. . . Lung Cancer Kills more people in the United States then any other cancer. . . and receives the fewest dollars. I wonder. . . how could that be? Is it because smoking and Lung Cancer have a stigma? Did you know ~ Over 60% of new lung cancer cases are never smokers or former smokers, many of whom quit decades ago. One in five women and one in twelve men diagnosed with lung cancer have never smoked. Lung cancer surpassed breast cancer as the #1 cancer killer of women in 1987. Twice as many women die from lung cancer each year than from breast cancer. Lung cancer will kill more women this year than breast, ovarian, cervical, uterine and vaginal cancers combined. Lung cancer will kill more men this year than colorectal, prostate, pancreatic, and melanoma cancers combined. Women who have never smoked appear to be at greater risk for developing lung cancer than men who have never smoked. Women tend to develop lung cancer at younger ages than men. We know these hard, cold fact personally. Lung Cancer hit our family like a fright train six years ago. Lung Cancer killed our father. 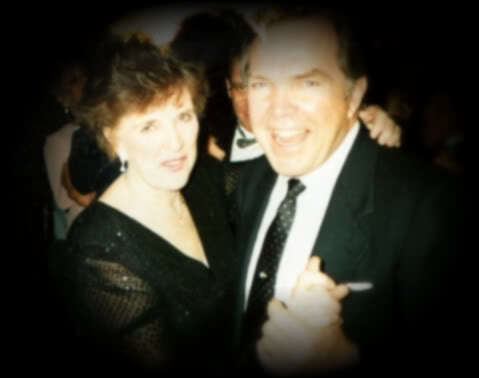 Lung Cancer killed my mothers husband of 56 years. 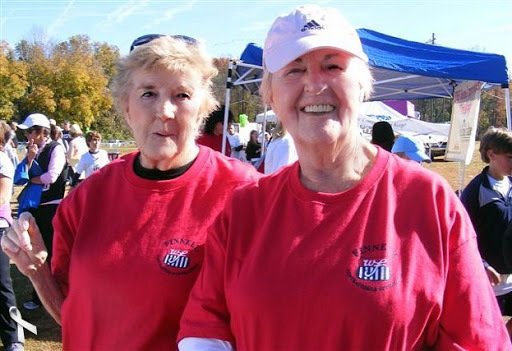 Lung Cancer changed our lives. Lung Cancer burned a whole in our hearts. My father never smoked. He never lived with smokers. He exercise everyday of his life. He even exercised in bed when he couldn’t get up anymore because the lung cancer took over his body. Don’t think just because you live a healthy life style you won’t be affected. Lung Cancer doesn’t care. Anyone can get lung cancer. 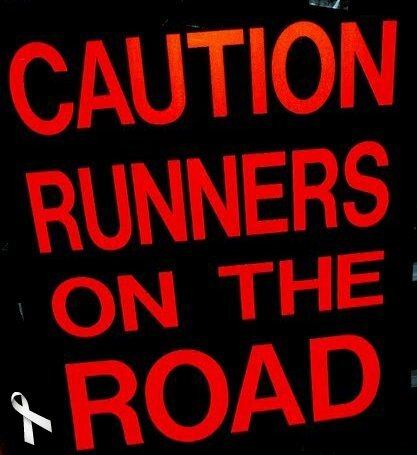 So as I said before, if you hear about a Lung Cancer run this month. . .get out and support. It really doesn’t matter if your a runner or not. We just need you! Editors Note: Because I have received many e-mails and comments saying the information I have in this post about Lung Cancer is vital to our community, I thought I would keep this post going for the week by playing many memes. I have also had many comments and e-mails telling me people would be putting this post on Facebook and Twitter. Thank you for stopping by my little blog and taking the time to read this post. If you need more information about Lung Cancer and it’s stigmas please go to the Lung Cancer Alliance Link I have on my blog. The Cain Halter run was last week and since it IS a cause we ALL care deeply about, we thought we would get together and give this run our all. We know this is true because, one of those 160,000 was our father. I will tell you this, when you lose just one of those 160,000, it really does feel like you lost ALL 160,000. It’s devastating to think. . . HE never smoked. He never lived with smokers. HE always lived a healthy life style. HE exercised everyday, even up to the last weeks of his life. When he couldn’t get up anymore, HE exercised in bed. . .YES! In Bed. And still he died. . . of Lung Cancer. Just in case you missed that, I want to make sure you heard me; Over 60% of new lung cancer cases are never smokers or former smokers, many of whom quit decades ago. Because we really care about Lung Cancer and we have to change the stigma. 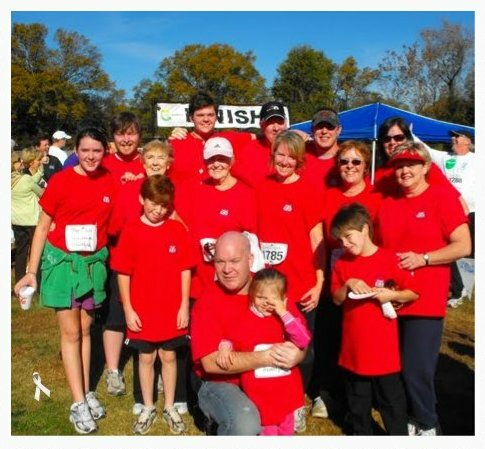 . . we turned into Team Finnell. . .AGAIN! But, this time with shirts. We hit the road! To walk. To run. To support. Friends came out and ran with us. Speaking of beautiful friends and woman heres another fact for you: Lung Cancer has surpassed breast cancer as the leading cause for cancer death in women. Do you know: you don’t have to be a smoker to get lung cancer? With this in mind, we clung to each other and supported. . .like we always do. We made it to the end. . .Like we always do. We ran on the Faith of our Father. . .We ran with his spirit by our side. We ran meeting people who were survivors. 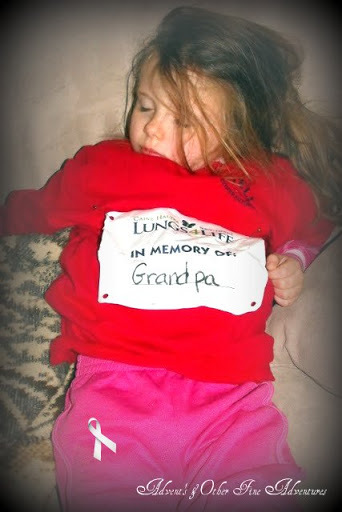 We ran with people who lost loved ones , who were runners. . . It effected us deeply as we thought of what was. It effects us deeply as we think of the facts. 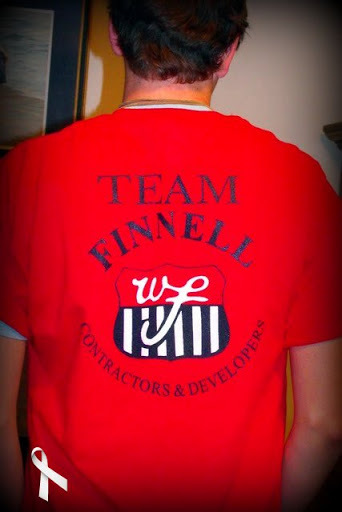 We stand united AS “Team Finnell” . . . now with shirts. Even though everyday we remember . . .There are some things none of us will ever understand. 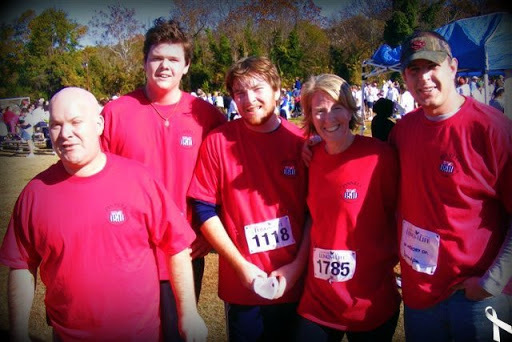 Maybe, just maybe a little family run for Lung Cancer might help us heal, one year at a time. Birthdays this Week ~ Stupid February! So this is it….The big birthday week. And we are all trying really hard thinking of ways we can make IT stay away…..but we know we can’t. Margaret’s birthday is Tuesday and then……my father’s birthday will be Wednesday……Ash Wednesday…… and we have to do it without him. I keep telling myself we should celebrate. It was so wonderful having him here with us. He truly left the world a better place. Life and Love should always be celebrated. And then I think we should celebrate Margaret’s birthday even though she doesn’t want to. I can hear our father saying……”You have to celebrate. It is better then the alternative.” And I laugh and I wonder…Does he still think that……I can also hear him say; “Of course you will celebrate. I am so glad she is there with you.”….and then I think….. I am glad she is here too and then I cry. It has been a very hard month for all of us. I haven’t posted much at all this month just because I really don’t know what to do. I have been dreading this whole week. I have been holding my breath all month not wanting to think about it at all. So NOW….IT is coming and I sit here………. thinking. Should I post his picture on Black and White Wednesday? After all it is his birthday and I really like playing that game….. Do I post a picture of him and Margaret? After all we always celebrate their birthdays together……Or do I do nothing? But I do know I miss him. I miss him being excited about life……..and because today is Valentines Day and he always made it special for our mother. I miss him being excited because James in now at a University and Matthew made the Dean’s list at the community college and he is still in high school. I miss hearing his “WOW”. I miss him being excited because Stephen is such a do-er and being so very pleased because Steve “did it” just the way he would of. I miss hearing him call all the girls “Dear” and everyone of those girls…..young or old….whether they knew him or not..… thought they WERE his one and only very special DEAR…….. I just miss so much about him. AND It just doesn’t feel right going into the week not acknowledging the fact February 16 is Margaret’s birthday and February 17 is his. Please don’t forget to Ask Congress to support the Lung Cancer Mortality Reduction Act of 2009….It really is very, very important. It could save your life or someone you love. So anyway, I was talking to a group of woman I know from the Co-op I take the girls to. We were talking about things we would like to see our older daughters do to reach out and help others. The leader of the group came up with taking the girls down to the local soup kitchen and letting them make sandwiches for people in need there. Wow! That is a good idea we all agreed. We talked about getting the girls down to the shelter on a weekday. I told one of the moms I would be happy to take her daughter…She asked me if I could take just a few more girls….. I told her …..No, I couldn’t. I don’t have the room in my car. I would have Mary Elizabeth and maybe Stephen. First, I do not want to get into the habit of making my babysitting issues the older kids problem. Then the big one……The potty…..I do not want Mary Elizabeth comfortable with just anyone touching her bottom. Her brothers and sister have never taken care of that. It is totally my job, I said. I do not want any of these kids that comfortable with each other. This made me feel REALLY good. This woman has 7 maybe 9 children and she is calling ME a good mom. So that day I am cruising along….. thinking about how totally awesome I am…..and What a Good Mom I am not to have my older children baby sit. I pick up Matthew at 6 P.M. from his Anatomy Class…….Driving towards home Mark calls. He tells me he wants to take everyone to see Carroll Brown sing at the local Irish Pub in Spartanburg. We have been there before and we both thought it would be a nice night for everyone. There are people there of all ages and it is kind of like an Applebee’s or even a Ruby Tuesday’s. We talked about some more. We decided I should just go home and see how things go. He takes Kathryn to basketball practice. Liz took a nice long nap in the car on the way home…..and I figure……Well, Kathryn and the boys will really like it…….Liz will be up until 12 now anyway. It was great! We had a great time….ALL the kids really enjoyed the night. Carroll came over to our table: talked to us, told us how awesome we were for taking our kids out to see him and how much he really appreciates it. He even dedicated a song to us…..The Voyage…a love song. He dedicates a song to Mary Elizabeth and we are feeling really good about ourselves. I take a deep breath and before we leave I take Liz to the potty. This VERY, VERY drunk woman staggers into the bathroom. She is STUMBLING all over her very nice shoes. I look over my shoulder and around the wall. To my great surprise I see this NAKED BOTTOM lying curdled up sideways on the floor….Pants down around the knees and very nice shoes. I turn off the water at the sink, take my daughter’s hand and walk towards the door…To leave. I think…. Is she hurt???? Then I see the Naked A@@ get up on her knees…….never saying a word….never mooning…and then “IT” lies back down to what I think was to go to sleep or pass out…..HALF NAKED right in front of the stall door. To think of it now……..I think she must have thought the toilet was by door and when she went to sit down….she missed by maybe two feet. I walk out and say……..”SLOB”…….over my shoulder. I go past a waitress and tell her she needs to get the manager to go into that bathroom and check things out. I never tell her what is in there. I just want to get my kids out of this….BAR! I hear the waitress I told laughing nervously asking another waitress to help her with the “HALF Naked Drunk” passed out in the bathroom. All I could think of was Kathryn might want to make a potty run before we headed home for the 50 minute drive….AND what a great surprise she would walk into. My poor babies!!! I was called “Such a Good Mom” yesterday. how could he do this to me??? It wasn’t until I started telling my mother all about being mooned by the drunk did I see the humor in the night…….Now I can’t stop laughing about it all……..THE Naked bottom……my reaction of walking out of the bathroom only offering my opinion and NO help…..the comment made to me about being a good mom…blaming Mark and then not finding all this funny until I tried to tell someone else. Gee, I wonder if the woman that called me a good mom would still think so after reading this……..I don’t think anyone from the co-op even know about this blog…… . Oh! ……..Don’t forget to sign the petition and/or write a letter to your local Senator and Congress man about Lung Cancer Research….It is now in the US House and Senate. You can go here to sign the petition or even write a letter…..You can click here….or here or ever here. * More people than breast, prostate, colon, liver, kidney, and melanoma cancers… COMBINED. Staggering but All too true…..Sadly, we know. You don’t even have to smoke or live with smokers to get it. You can click here if you still need too…….It really is important……. to all of us. I have been thinking about this all week….What picture should I post to play Lisa’s of The Long Road to China Black and White Wednesday . I had so much fun with it last week I wanted to play again. Then I found the button I put on my blog the other day and I really want people to know how very important this is for all of us. * Over three times as many men as prostate cancer. * Nearly twice as many women as breast cancer. * An average of 437 people a day. I know it is true because my father died of this terrible disease. You do not have to smoke to get this…….He NEVER did. He did not live with smokers. He exercised everyday…even up to the last week of his life. When he was to weak to get up: he did tricep push ups, leg lifts and small crunches in bed. My father’s doctors would jokingly telling him he was the healthiest cancer patient at the Cancer Center. Although he died. We were lucky……We got to know him….We got to love him. We still feel him with us. This is the picture that I choose. I am not sure if I like in Black and White. It looks like it was taken to long ago. Do your self and your family a favor……Sign the petition and/or write a letter. Make the Senate and Congress do something good for the American people for a change. It does not matter what your political views are…….It only takes a minute and your on the computer anyway. We all want a cure for Cancer. I came across the button I am putting on my blog today. To me it is the most important thing I will ever have on this thing. 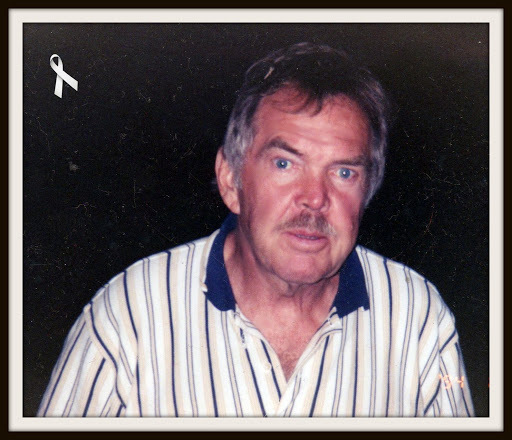 Most of you know my father died of NON-smokers cancer September 30, 2009. This never should have happened in our family. My father was always the picture of health. He NEVER smoked, he did not live with smokers, he always exercised. He even exercised up to the last week of his life. He ate the way “they” tell you…He loved his family and his life. Sadly, my family has learned NO ONE is safe from this disease. It really does not matter your political view point. Just take action……take time to write a letter and sign the petition. This is the letter I sent ~ Not one of my best……but I wanted to get the job done TODAY. September 30, 2009 lung cancer killed my father. When he was first diagnosed you could have knocked the family over with a feather. We were all in a state of shock to think this vibrant healthy man was sick with Stage Four Lung Cancer…His request to his team of doctors was for them to move fast and treat him anyway he they could. My father under went many experimental treatments. He fought his battle for 4.5 years with the doctors cheering him on…until the cancer went into his bones and then to his brain. At this point the doctors washed their hands and cowardly moved on to other cancer victims. He still fought on with his family by his side. NO-one fought hard then he. If you have never smoked, never lived with smokers, always exercised and love your life….Do NOT be so arrogant to mistake your safety or family’s safety form this disease…You could be next. Please for the sack of the American family put your politics aside and fund this very important bill. I am asing YOU to please send your own letter or copy mine……I don’t care. Just do it……….PLEASE!!! NO-one should have to go through this…..Mostly the cancer victim. It has been 20 days now…. Three weeks…Just three weeks……I still just can’t believe it…. My mother wants us to write about funny times or funny conversations we have had with our dad……The thought of this makes me hold my breath so much I just don’t want to let go…..I really am not sure why but I think I am afraid I will not be able to think of anything good enough. ….Right now I just can’t think of anything. I think I maybe able to write about the time I took my dad to the hospital when he fell and broke his hand…..I could write that Matthew was just a baby and my mother was just home from the hospital after having surgery. I was at their house getting dinner ready for them. I walked out to the gym to tell my dad dinner was on the table and I found him on the couch just lying there with his eyes closed. When I went in to see what was wrong, I learned he had just fallen off a ladder and he thought for sure he had broken his hand. I wanted to take him to the hospital right away but he wanted to “get cleaned up, check on my mother and most importantly have dinner. I remember he even had a glass of red wine that night before he was ready to leave. I could tell about the conversations we had that night, I remember them so clearly and I could tell how he would not let the doctor cut off his wedding ring to set his hand. How he showed the doctor just how to slipped a ring off a swollen hand with dental floss ……. When we were done at the hospital it was very late. I could then write about going out for ice cream with him and how much I loved every minute of that night I got to spend with him all alone. I could tell about the times I use to exercise in the gym with him when I was a teenager and how I loved it all. I could tell about running around the block with him and when we would see the telephone pole closest to our house we would race and I would win…. every time. He was always so delighted with my win encouraging me to run faster the next time. I could write about the times he would just walk his teenage daughter around the block and hold her hand because he knew it was important that we walk and not talk and he just be there. I could tell about the many times he and our mother would be celebrating another anniversary. How he would take his three girls out to a night of fine dinning……And how he would have the wait staff bring out a splendid silver tray only to reveal a beautifully wrapped gift hidden inside the silver cover for his one and only sweet heart. My sister and I would delight in the glory of just how much he loved our mother. 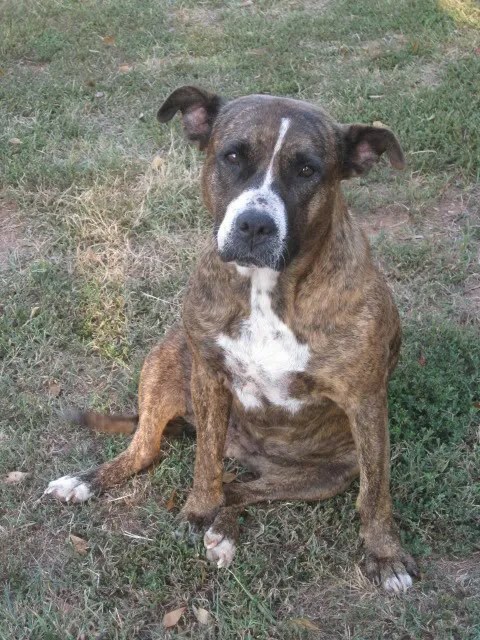 I could write about the time Ruff-o came to live at my parent’s house and my father would buy her hamburger and bacon; cook it all up, cool it off, throw cheese into a large bowl and then give it to this strange stray dog that just appeared out of the blue one day. I could write about the time just last year when he was knocked off his feet by that same dog and broke his hip. How he had called me very matter of fact-ly asking if I had the crutches. When I told him, I did he asked me to bring them over when I “HAD A MINUTE.” And if the boys where around ask them to come too. I would not forget to make sure I wrote about how he told me not to rush and most importantly “DO NOT! go through the house and upset your mother.” and how he said “To just go around back and you will see me.” I would have to say; I was just getting out of the shower when he called and how I RUSHED right over knowing my father never wanted to make a big deal out of him self or inconvenience anyone. I would have to say as I drove up to the house I searched for him from the moving car. I would have to say when I finally parked the car I jumped out and ran around the back of the house thinking he had fallen in a hole and hurt his ankle by the garden. I would have to tell how I could not see him and then decided to call his cell phone. I would have to tell how he answered my phone call with a “Bill Finnell” like there was nothing wrong and I was just another customer……… We would laugh here because we all know exactly just how he sounded. And they’re coming to take me away, Ha-haaa! But, I think I will tell about the time my parents evicted a woman from an apartment and how the woman called crying and how if they just gave her until tomorrow she could straighten it all out……… ((this was after 3 months of none payment and ignoring phone calls and letters written)) My father was ferrous and tired of all this by this woman. He had finally had her attention and boy was he going to let her have it!!! She was going to pay him or move and that was that. ……my mother and I felt bad for her but we knew if we allowed her back into the apartment for the night that would be it. She would not pay her rent or back rent and …….We would be the laughing stocks at the court house the following day. It was February and about 7:30 PM. It was a cold night and the forecast for the early morning was to be in the teens. We could hear the conversation from the other room. My father’s calm voice telling her how it was going to be…. and how she could get her things from the apartment in the morning. He would not meet her that night…It was to late…It was to cold and that was that….. He got off the phone and said he would be right back. He was going to get this woman a hotel room…..He couldn’t allow her to sleep in her car. After all it was going to be in the low teens that night. She said she would have all the money due to them in the morning if he would just give her a chance…..She didn’t want to leave her apartment. She liked her home where it was. She promised she would do better from then on. I remember many things he said to me that night and how it was just so nice being there in the car with him. I remember even though it was very cold that night the car was warm…the conversation was wonderful and the company was the best. We all loved our time alone with him and you know he loved it too. As I think about the past week and the tremendous effect it will have on the rest of my life…..I can’t help but think how do I carry this? How do we move forward like my father wants us too? How do you respectfully keep going, stay positive and live up to his memory? Just how do we do that? However, that was not the part I am speaking of……….The one thing she said that stuck with me was…….”I always found comfort in knowing my Dad (and Mum) were only as far away as my heart.” “Just listen…you will hear him.” She is so right…….I can feel him……… everywhere. He truly is everywhere. I want to remember how my mother, my father’s wife of 56 years, has been a pillar of strength for her husband and her children through out this whole ordeal. During the times my father was sick because of cancer, radiation or chemo….my mother was always by his side, taking care of him. She was always encouraging him to get up and eat with the family. She was always encouraging him to get up and sit with the family. She was always encouraging him to keep working and to keep going. The last days or weeks of his life it was our mother that let us sit with him and keep him company. On the really bad days she generously let us be alone with him and just hold his hand. She let us help her, help him. She was truly amazing. She IS truly amazing. These past four and an half years when the doctors would say…….”Bill, we don’t want you uncomfortable.” My mother would say “I just want him here….I don’t care about his comfort. Let’s just keep him here.” My father loved to hear this. He would smile his biggest smile and laugh with pure joy and say…”That is the nicest thing she could ever say to me.” He accepted her words for what they were……True Love. When it was time to let go….She simply knew and as hard as it was for her……she did….again…..True Love. She knew he would be with her forever……living in her heart. I want to remember my Aunt Mary Lou and how she stayed with my parents the nights she was really needed. I want to remember how she let my mother sleep and how she stayed up all night with my dad watching over him, helping him anyway she could. I want to remember the love and dedication she gave to us, my father and most of all her sister, our mother. I want to remember how my sister in law, my brother in law and my husband would make time to see my dad everyday. How Linda helped with his care giving her time so lovingly. How Reiner worked in the yard, Mark worked on the equipment and how both of these men would go and just sit with our dad. They would just sit with him, letting him know he was never alone. I want to remember, my oldest three children serving on the Alter at my father’s funeral Mass. How Matthew held the cross as high as he could…..I know he wanted his Grandpa to see it, to feel the love, admiration and how honored he was to be part of his Mass….I want to remember how each one of the children stood on the Alter with pride and just how lovingly they served for him and my mother that day. I want to remember how the older grandsons were pallbearers for my father and how James and William read the readings at the Mass with such dignity and respect. 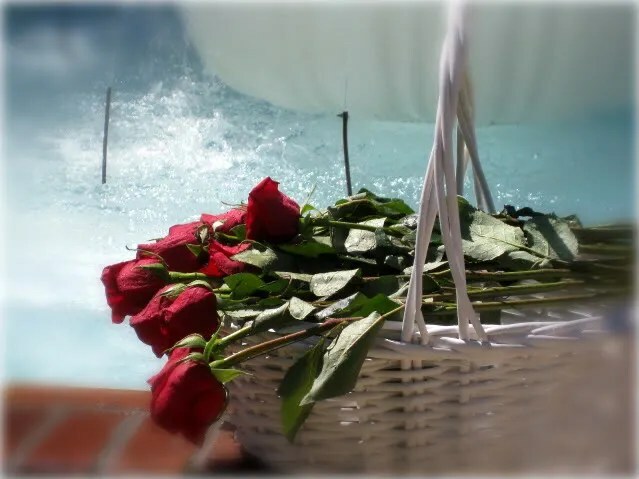 I want to remember how each one of the grandchildren put a rose in a basket on the Alter by my father’s casket and how significant that act of love was for both my parents. There is nothing more important then family… The final act was perfect and honored them both in such a way I never dreamed possible. 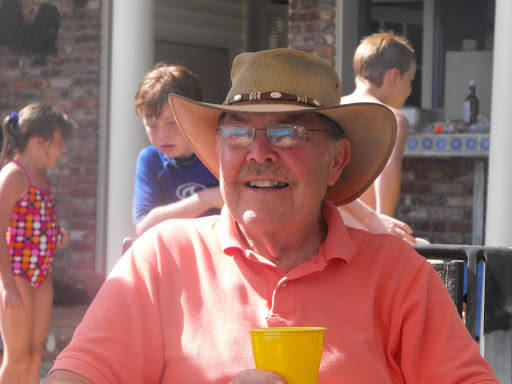 I want to remember, Jen’s eulogy and how she started it off with ….”Uncle Bill, you can not drive.” And how Jen’s tribute to my father left everyone with a smile on their face……Just remembering. I want to remember the day of the wake: When we were trying to get the house ready for all the guest…..Jen was there working, helping us get ready. She told me she needed to run to the store and she needed me to show her how to get there. I want to remember how I really didn’t want to go but she insisted. After all, as she said, she lives in California now and she could get terribly lost…. She said it was very important that I go with her…to show her the way. In reality it was important to me. She knew I was becoming over whelmed and had to get out. Our ((or at least my)) spirits were lifted as she filled 2 great big carts and baskets with mums, pumpkins, candles, flowers, and a wreath. After the shopping we were off to McDonald’s for a nice FAT comfort meal that we both seemed to enjoy all to much. Jen said she wanted to get all those things to bring happiness and color back into my parent’s home…… and that is exactly what she did. On the way home that day I realized she had a GPS in her car and I thought she lied….. But I am so glad she did……She knew I needed to get out more then she needed me to show her the way. I remember saying to her….”Thank you for making it sound important that I come….I needed this.” I think she said; I know. I want to remember how Aunt Ann sang and just how beautiful her voice and the songs we picked were that day. My father loved her voice and to have her come down and sing would have been such and honor for him. I want to remember; how her daughter Peggy and Aunt Ann’s husband Paul came down without a single thought. They just came a thousand miles to be with our family. It was all so wonderful. I want to remember the out-pour of friends and mostly family….how Ann Marie came back down even though she was just here a couple of weeks ago. It was just that important. And how Uncle Bernie and Sue showed up and made us all laugh and feel good about the day. I want to remember; how my in laws just came and gave and did. My sister in law, Kim, stocked the shelves and refrigerator at my house. She knew shopping was the last thing on my mind. She knew we were mostly out of everything…..The night of the my father’s wake I even came home to a very clean kitchen because of her. She knew walking in the door to a clean kitchen was almost better then a warm hug. I want to remember how very loving my dear sweet husband has been. How he comforted me and just gave to me when he was hurting too. Mark told me just how much my father meant to him and how grateful he was that when the odds seemed against him my dad was the only one who truly believed in him and gave him a real chance to prove himself in the business world. I want to remember the friends and family that came and cried and loved us. How my father’s brothers came down without a thought. I want to remember just how Uncle Joe and his wife came back down even though he and Aunt Millie were just here. I want to remember my cousin Lyn and her tears of love. I want to remember Uncle Bob and his wife, Pat, their daughter Patty and her children. I want to remember how both my father’s brothers told stories about their childhood and how the love shined through. Each tale told with devotion, humor, honor and joy. With each Aunt and uncle came their children…. Cousins I hardly knew. I want to remember Aunt Jean and Aunt Joan came with Kathy and Kristen. I want to remember how my aunts stayed just a few more days in an effort to make this transition just a tinny bit easier for their very good friend our mother. I want to remember my cousin Judy’s genuine sorrow. I want to remember how my friend Denise filled the pantry with food and paper products at my mother’s house and how she just thought of everything. I want to remember how my friend Kim just showed up at my parent’s house the morning of the wake and started cleaning bathrooms….How our girl friends from the karate school were just there in my mother’s kitchen after the funeral putting deserts they made on the table, making coffee, feeding my mother, my children, my sisters and me. It was an amazing display of love…..pure affection. I have started this post 100 times. Maybe I have even started it a thousand times if you count the times I have started it in my mind: I just can’t seem to get the words down. This…….is taking me so long. It has been 8 days now since my father passed away. Passed away…..That sounds so strange to say….8 days almost seems like a 8 hundred years and then again it seems like 8 seconds …I just can’t believe he is gone. I can’t believe I won’t talk to him again or see his smiling face. Losing him is such a great loss for all of us. I just don’t know how we are going to move forward…..But we will…Because we have too. That is the way it is done. Everyone should have known my father…….He left an impact on the world. He actually left it a better place. He was kind…..tough and loving. He was an incredible man. He was an incredible father. I know, not many people have that……but we did. The one thing I don’t ever want to forget is my father’s strong spirit. He was our teacher right to the end. As my father’s body grew weaker daily, his spirit grew stronger daily. As the changes came to his body: He never grow to like them…..He grew to accept them with Grace and dignity. He was Gracious and Loving right to the end. I had the chance to see my father everyday and these past months help with his care: Every day I would ask him how he was…….. Even on his weakest days he would say; “I’m good dear, very good. I really feel very good…… How are you?” I would tell him I was good. I was very good and in return he would say……Good Dear…that’s good. Then he said in a louder, stronger voice: “Alright, Alright I am coming……He looked at me and said, “I have to go Dear” ……..I told him I knew. I told him I loved him and then he settled down for a short while and then struggled to get up again. Later that same day he said “Bye, Bye Dear” to my sister. He died early the next morning with his wife of 56 years and her devoted sister by his side. My heart is so heavy. But, strangely enough it does not feel like it will explode out of my chest anymore…..The loss is greater then I could have ever imagined and the tears come unexpectedly and freely. I really don’t think that will change as we move forward and try this new life without him by our side. I am not sure how we are going to do this thing but I know we will. And I know It will be Good…..It will be very Good because he his given us the strength, courage and so many gifts along the way to make it good; To make it very good….